Viber’s got a new feature that will help protect your most sensitive conversations from discovery—as long as the CIA hasn’t pwned your phone. A new feature called Secret Chats—not to be confused with Facebook’s secret conversations—is rolling out in the coming days to Viber for Android and iOS. Secret Chats builds on some of Viber’s pre-existing privacy and security features including end-to-end encryption and self-destruct timers for photos and videos. Instead of setting a time limit on a single piece of a conversation, Secret Chats schedules the entire thread for auto-deletion. The new feature works whether you’re in a one-to-one chat or a group conversation. Viber also does its best to prevent others from taking a screenshot for posterity of what’s supposed to be an ephemeral thread. Android users will be prevented outright from snagging a screenshot of a secret chat thanks to how deeply developers can sink their hooks into the operating system. On iOS, however, all Viber can do is throw up an alert to all conversation members when someone takes a screenshot. Viber also prevents secret chats from being forwarded to other contacts, and users can set a PIN on a secret conversation in case their device is lost or stolen. Similar to Facebook Messenger, on Viber you can either engage your contacts in a standard Viber conversation that doesn’t auto-delete or begin a secret chat. The story behind the story: Self-destructing timers are nothing new. They can be found on everything from Snapchat to Facebook Messenger. But the ability to auto-delete an entire thread goes beyond what most mainstream messaging apps do. Entire secret conversations on Facebook can be deleted, for example, but not automatically. The fact that these features extend beyond one-to-one conversations—another limitation of Facebook Messenger—is also helpful. 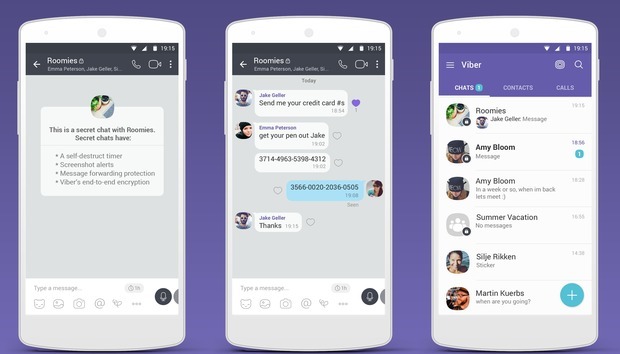 The new features probably won’t drive users away from their favorite messaging apps to Viber, but it’s a big plus for those who do use the platform.